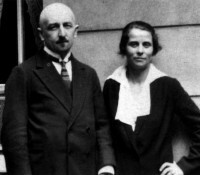 When he was at the Prieuré, Mr Gurdjieff worked with me a great deal on music, but not for Movements. The exercises he showed in August 1924 were the last new Movements he ever gave at the Prieuré. Beginning in July 1925 he began to create another kind of music, which flowed richly from him during the next two years. I had a very difficult and trying time with this music. Mr Gurdjieff sometimes whistled or played on the piano with one finger a very complicated sort of melody—as are all Eastern melodies, although they seem at first to be monotonous. To grasp this melody, to transcribe it in European notation, required a tour de force. How it was written down is very interesting in itself. It usually happened in the evening, either in the big salon of the château or in the Study House. From my room I usually heard when Mr Gurdjieff began to play and, taking my music paper, I had to rush downstairs. All the people came soon and the music dictation was always in front of everybody. It was not easy to notate. While listening to him play, I had to scribble down at feverish speed the tortuous shifts and turns of the melody, sometimes a repetition of just two notes. But in what rhythm? How to mark the accentuation? There was no hint of conventional Western metres and tuning. Here was some sort of rhythm of a different nature, other divisions of the flow of melody, which could not be interrupted or divided by bar-lines. And the harmony—the Eastern tonality on which the melody was constructed—could only gradually be guessed. It is true that Mr Gurdjieff would repeat several sections, but often—to vex me, I think—he would begin to repeat the melody before I had finished writing it, and usually with subtle differences and added embellishments, which drove me to despair. Of course, it must be remembered that this was not only a means of recording his music for posterity, but equally a personal exercise for me to ‘catch’ and ‘grasp’ the essential character, the very noyau, or kernel, of the music. And, I might add, this ‘catching the essence’ applied not only to music. For me it was a constant difficulty, a never-ending test. When the melody was written, Mr Gurdjieff would tap on the lid of the piano a rhythm on which to build the accompaniment, which in the East would be played on some kind of percussion instrument. The entire melody, as given, would somehow have to blend with the background of this rhythm, but without ever being changed or adjusted to fit the accompaniment. And then I had to perform at once what had been given, improvising the harmony as I went. When I began the work of harmonizing the melodies, I very soon came to understand that no free harmonization was possible. The genuine true character of the music is so typical, so ‘itself,’ that any alterations would only destroy the absolutely individual inside of every melody. Once Mr Gurdjieff said to me very sharply, ‘It must be done so that every idiot could play it.’ But God saved me from taking these words literally and from harmonizing the music as pieces are done for everybody’s use. Here at last is one of the examples of his ability to ‘entangle’ people and to make them find the right way themselves by simultaneous work—in my case, notation of music and at the same time an exercise for catching and collecting everything that would be very easy to lose. It gradually became Mr Gurdjieff’s custom, when he returned from Paris, to work with me on new music notation. After supper, when everyone was gathered together, the most recently harmonized music was played, then the latest text of Beelzebub was read, after which music was played again. Here, unexpectedly, Thomas de Hartmann’s writing stopped. He died so suddenly that he had not even read what he had written. The evening before, he had played with tremendous force his Second Sonata for Piano, dedicated to P. D. Ouspensky’s idea of the fourth dimension, for a group of musical friends who would not be able to attend the concert that was to take place in two weeks. So I was left with an unfinished manuscript, which my husband felt to be very important—as can be seen from his Introduction. In the first chapters he described in detail a period of Mr Gurdjieff’s Work from which only I am alive. I felt that my husband’s writing should not be left unfinished, but I can continue it only by describing my own experiences. To be impartial, not too personal and as sincere as possible is a very serious task for me. It has to be an account of our last years with Mr Gurdjieff as seen through the eyes of one of his pupils. I hope Mr Gurdjieff himself will help me to be unconcerned with other people’s judgement of what I write. My veneration of him and of his teaching is profound. So I feel free to say what I judge to be true, subjective as it may be.